How to log in: Learn how to login and get started with Shell Card Online. 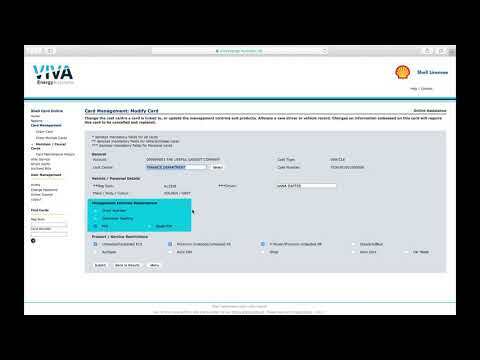 A narrated and visual guide demonstrating how to log into a Shell Card Online account, as part of a series of Shell Card Online video tutorials exploring the key features of the service. Title card welcome message accompanied by Viva Energy Australia Logo at top left, Shell Licensee and Shell pecten at top right. Narrator: How to log in. The Card Management page of Shell Card Online website. Electronic File Download page of Shell Card Online website. An Excel spreadsheet with rows of data. Narrator: whenever you need it. Screen shows an internet browser and address bar. Narrator: To log in, simply open your web browser and type in vivaenergycards dot com dot au. Home page of the Shell Card Online website. Narrator: This opens the Shell Card Online home page. Next, click on the login button. LOGIN button visually highlighted, opening to the User Login page of the Shell Card Online website. Narrator: If you have registered for a Shell Card Online profile with your account, you should receive an email with your username and a separate email with your password from our Shell Card Online team. Simply enter these details into the User ID and password fields. User details are entered into password fields. ‘Click here’ section of login page highlighted. Narrator: and you will be sent an email with further instructions. If you have any trouble resetting your password, please call customer service on 13 16 18. We’ll be happy to help. The User Account page of Shell Card Online website. 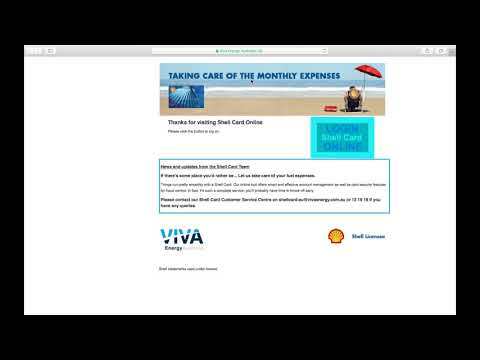 Narrator: If you would like to set up a new Shell Card Online account, simply go to the Shell Card Online section at www.vivaenergy.com.au and you can register there. Change password: New account or forgot your password? Learn how to change it here. 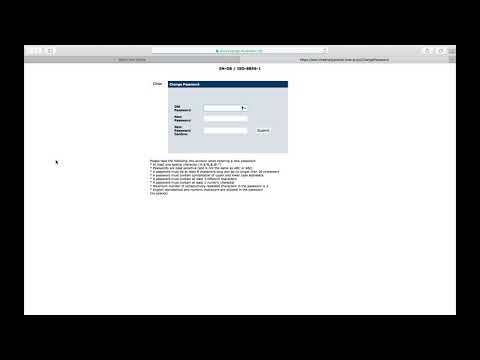 A narrated visual guide demonstrating how to change passwords with a Shell Card Online account, as part of a series of Shell Card Online video tutorials exploring the key features of the service. Narrator: How to change your password. The Welcome to Shell Card Online User account home page. Narrator: With Shell Card Online you can change your password at any time. Once you’re logged in, look for ‘change password’ in the menu on the left. Click on this to open a pop-up window. The Change Password screen from Shell Card Online website appears. 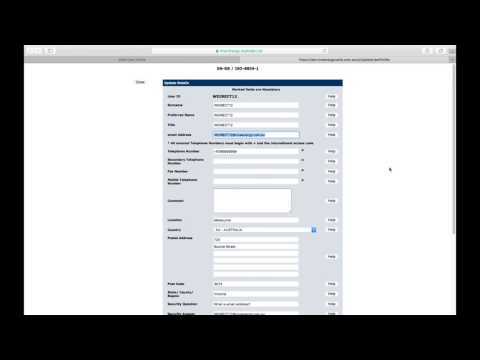 Details are entered into the text fields of the change password form during narration. Narrator: Type in your current password. Then type in the password you want to start using. It’s a good idea to familiarise yourself with the password rules first. Confirm the new password and click ‘submit’. A red error message has appeared on the Change Password screen. Narrator: If there are any problems a red note will appear. Check your passwords and try submitting again. If you still have problems, please call customer service on 13 16 18 and we’ll be happy to assist you. The red error message disappears from the Change Password screen. 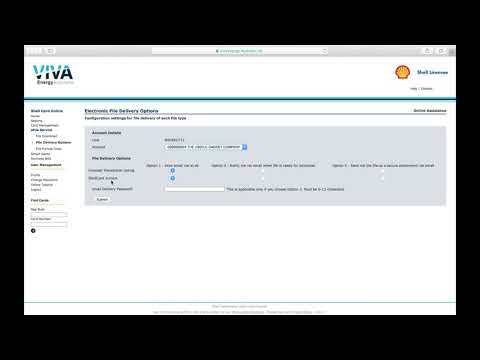 A narrated visual guide demonstrating how to update your details with a Shell Card Online account, as part of a series of Shell Card Online video tutorials exploring the key features of the service. Narrator: How to update your details. Narrator: With Shell Card Online, updating the details in your profile is easy. Simply go to the User Management section on the home page and select the ‘profile’ option. User Profile page opens in browser showing personal detail fields. Narrator: If you need to make changes, for example if you get a new email address or your office relocates, make them here and click ‘update’ at the very bottom of the page. Demonstration shows navigation down to ‘Update’ button on User Profile page. Narrator: Please note that any changes you make will only update your profile details for Shell Card Online, and not your Viva Energy Australia billing or contact details. To make changes to your account, please call customer service on 13 16 18 and we’ll do that for you. Order new or additional cards: Need to order a new, extra or replacement card? Here’s how. 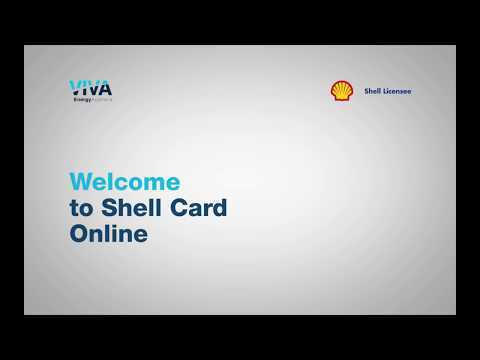 A narrated visual guide demonstrating how to order new or additional cards with a Shell Card Online account, as part of a series of Shell Card Online video tutorials exploring the key features of the service. Narrator: How to order new or additional cards. Narrator: With Shell Card Online you can order a single new Shell Card or multiple cards easily through the ‘Card Management’ option on the home page. Cursor navigates to Card Management option at left of screen, opening the Card Management: Order Card page in browser. Narrator: You will need to select the type of card you want, either Vehicle or Personal. Choose ‘Vehicle’ if the card is for a particular vehicle or choose ‘Personal’ if the card is for a particular driver. Cursor navigates to Card Type drop down menu, highlighted visually. Narrator: Then enter details about the vehicle or individual assigned to the card. Cursor navigates to Vehicle / Personal details section of page, highlighted visually. Narrator: These are mandatory fields, so you won’t be able to continue unless they’re all completed. Cursor navigates to display different drop down options. Narrator: The fields are different for Vehicle cards and Personal cards. These mandatory fields are prompted here for each Card type. Cursor navigates to Management Controls Requirement section, highlighted visually. Narrator: You can set Management Controls to apply specific restrictions on a particular card. For example, it can be helpful to make it mandatory for card users to provide odometer readings every time they refuel, to help you monitor wear and tear and the maintenance needs of your vehicles. Cursor navigates to Odometer Reading check box in the Management Controls Requirement section, selecting and deselecting the Odometer Reading option. Narrator: You can also restrict the card to particular products in the Products and Services section. Cursor navigates to Product / Service Restrictions section, highlighted visually. Narrator: Simply make your selections as appropriate. Cursor navigates to and selects the Diesel / AdBlue option in the Product / Service Restrictions section. Narrator: When you’re done, click ‘submit’. Easy. Your new Shell Card or cards should arrive by registered mail within ten business days. If you have problems at any stage, please call customer service on 13 16 18 and we’ll do our best to help. Reset your card pin: See how to reset your Shell Card’s PIN. A narrated visual guide demonstrating how to reset the PIN on your card with a Shell Card Online account, as part of a series of Shell Card Online video tutorials exploring the key features of the service. Narrator: How to reset the PIN on your card. Narrator: If you forget your PIN, lose your card or just need to reset it to reduce the risk of fraud, you can change the PIN easily through the ‘Card management’ option on the home page of Shell card online. Cursor navigates to Card Management option at left of screen, opening the Card Management page in browser. Narrator: Click on ‘Maintain and Cancel Cards’. Cursor navigates to Maintain / Cancel Cards option at left of screen, highlighted visually. Maintain / Cancel Cards options page opens in browser. Narrator: Then find the card you want to reset by typing in either the card number, vehicle registration number or driver, and clicking ‘search’. Cursor navigates to the Reg Num field, where registration details are entered. Cursor navigates to the search button at bottom of page and clicks, which then opens the Card Management: Search Results page. Narrator: Alternatively you can select ‘account’, then choose the status ‘active’. Screen returns to the Card Management: Maintain / Cancel Cards page. Cursor navigates to a drop down menu, selects ACTIVE from the list, then navigates to the search button at bottom of page and clicks, opening the Card Management: Search Results page. Narrator: This will return all your active cards and may be easier if you don’t have many cards to search through. Choose the card you want to change and click ‘modify’ in the set of actions. Cursor navigates to Modify option and selects, opening the Card Management: Modify Card page. The Management Controls Requirement section is highlighted visually. Narrator: In the management controls section you will see the check box for ‘reset PIN’. You can only select this if there is a PIN associated with the card in the first place. Once selected, click ‘submit’. Cursor navigates to Submit button and selects, opening a Card Management: Message page. Narrator: You will then receive a message advising you that ‘your Shell Card request is being updated’. It might take up to an hour to process. Narrator: The next time you use your Shell Card you will need to enter your new PIN number. If you have any problems, please call customer service on 13 16 18 and we’ll be happy to help. Restrict purchases: Learn how to set limits on purchasing to control expenditure. A narrated visual guide demonstrating how to restrict types of purchases that can be made on your cards with a Shell Card Online account, as part of a series of Shell Card Online video tutorials exploring the key features of the service. Narrator: How to restrict types of purchases that can be made on your cards. Narrator: Are you worried about employees purchasing fuel that’s not approved, or cigarettes on your fuel card? To enable product or fuel purchase restrictions, simply navigate to the ‘Card Management’ menu on the home page. Cursor navigates to visually highlighted Card Management option at left of screen, opening the Card Management page in browser. Cursor navigates to the Maintain / Cancel Cards option, opening the Card Management: Maintain / Cancel Cards page in browser. Narrator: You can find the card you want to restrict by the card number, the vehicle registration number or the driver’s name, and clicking ‘search’. Card number, Reg Num and Driver number section are highlighted visually in blue. Cursor navigates to Reg Num field, details are entered, before cursor navigates to and selects the Search button at bottom of page, opening the Card Management: Search Results page in the browser. Narrator: Alternatively you can select ‘account’, then choose the status ‘active’. This will return all your active cards and may be easier if you don’t have many cards to search through. Narrator: A summary of the results will appear. Choose the relevant card and click ‘Modify in the set of actions. Cursor navigates to Modify option and selects, opening the Card Management: Modify Card page. Narrator: Check and uncheck the boxes to make the changes you want. Then click ‘submit’. Narrator: A confirmation screen will appear advising you that ‘your Shell Card request is being updated’. This can take up to an hour to process. If you have problems, please call customer service on 13 16 18 and we’ll be happy to help. Downloading tax statements: Prepare for your BAS by extracting your transaction statements. Learn how. A narrated visual guide demonstrating how to download tax statements with a Shell Card Online account, as part of a series of Shell Card Online video tutorials exploring the key features of the service. Narrator: How to download tax statements. Narrator: Is tax time creeping up? Shell Card Online lets you prepare for your BAS by extracting your transaction statements easily through the ‘eFile service’ option on the home page. Cursor navigates to eFile Service menu option at left of screen, highlighted in blue. The eFile Service page appears. Narrator: Click on ‘electronic file download’. Cursor navigates to and selects the Electronic File Download link, opening the Electronic File Download page. Narrator: Your entire transaction history will be displayed, sorted by date. Scroll through to find the reports you need and click ‘download’ for each. Cursor navigates to the Download option for the first entry, visually highlighted. An Excel window opens. Narrator: Once downloaded, simply save the file to your desktop. An Excel window, showing rows of data. Narrator: This consolidated report will help save you time by removing the need to look for individual receipts. And, you or your bookkeeper can even upload the file into your accounting package, saving you time with data entry. View fuel user information: Learn how to use Card List Reports to get information on specific users and card usage. 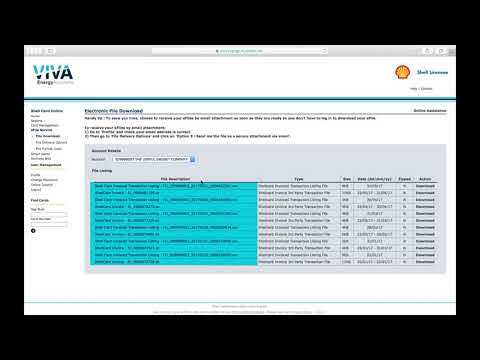 A narrated visual guide demonstrating how to get important information on fuel users through card list reports with a Shell Card Online account, as part of a series of Shell Card Online video tutorials exploring the key features of the service. Narrator: How to get important information on fuel users through card list reports. Narrator: Do you want information on specific fuel users in your organisation? Or you need specific information of when your employee last used their card? Cursor navigates to Reports option in menu sidebar on left of screen and selects. Reports page opens on screen, showing available options. Narrator: Click on ‘run reports’. Cursor navigates to Run Report option highlighted in blue, opening a Reports list. Narrator: Find ‘card list report’ in the list of options and click ‘view’. Cursor navigates to Card List Report highlighted in blue in the Options list and selects View, opening a Card List Report page. Narrator: Then specify which account you would like to extract the report from. You can refine the report by selecting the cost centre and card status. You can also define how you would like the results to be arranged, by selecting the primary and secondary sort fields. Cursor navigates to highlight the options available from the drop down menus. Cursor clicks on the Run Report button, opening a Card Listing Report page and highlighting relevant information in blue. Narrator: The report gives you information for all the relevant cards, including useful details such as card status, card expiry date and last used date. You can then choose to download or print the report for your records in the navigation bar at the top of the page. Cursor navigates to show the Download and Print options in the navigation menu bar at the top of the page. 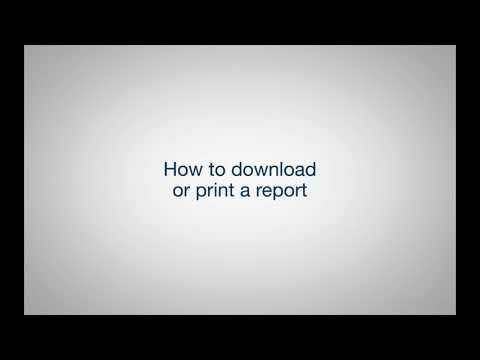 Downloading and printing reports: Learn how to download and print any report you and your business generates. 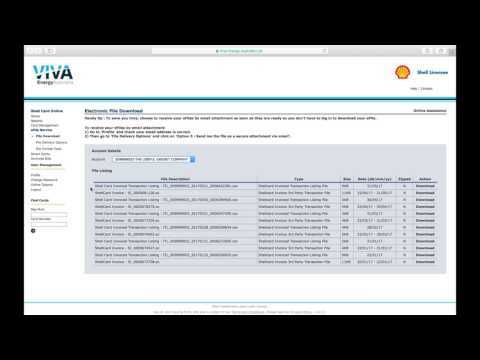 A narrated visual guide demonstrating how to download or print a report with a Shell Card Online account, as part of a series of Shell Card Online video tutorials exploring the key features of the service. Narrator: How to download or print a report. The Reports page of Shell Card Online website, showing a Card Holder Report. Narrator: You can download or print any report you generate. Cursor navigates to Download option in menu bar at top of Card Holder Report page, opening the Export Report page revealing options for download. Narrator: Simply click your preferred option from the menu at the top of the report. See transactions by department or cost centre: Learn how to attribute fuel costs to individual cost centres post-invoicing. 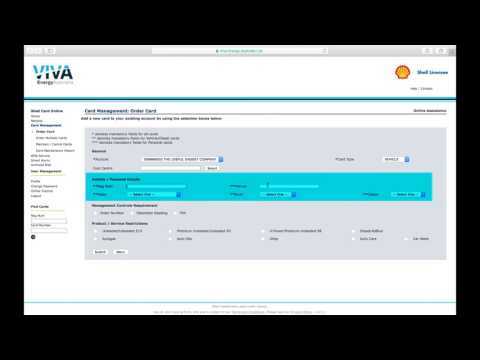 A narrated visual guide demonstrating how to get better visibility of transactions by departments or cost centre with Shell Card Online, as part of a series of Shell Card Online video tutorials exploring the key features of the service. Narrator: How to get better visibility of transactions by departments or cost centre. The Cost Centre Report Page of Shell Card Online website. Narrator: Do you need to attribute fuel costs back to individual cost centres within your organisation post invoicing? Cursor highlights options and selects Run Report button, opening a Card Group/Cost Centre Summary page. Narrator: The online portal can help you do this quickly by preparing a report that summarises purchases and financial information per billing period by Cost Centre. To enable this report, you must apply a cost centre to your card on your account. Screen cuts to the Welcome to Shell Card Online User account home page. Cursor navigates to Card Management option in menu at left of screen, then selects the Maintain / Cancel Cards option highlighted in blue. Narrator: Please go to the ‘Maintain or Cancel card’ page under card management and search for the card you would like to update the cost centre for. The Card Management: Maintain / Cancel Cards page opens, revealing a list of options. Cursor navigates to cost centre details and selects the Search button, opening a Card Management: Search Results page. Narrator: Select ‘Modify’ and update the ‘Cost Centre’ field. Then, simply hit ‘submit’. Cursor navigates to Modify action highlighted in blue and selects, opening the Card Management: Modify Card page. Cursor then selects the Cost Centre, opening the Card Management Select Cost Centre screen to reveal a list of cost centre options. Cursor selects cost centre and then selects submit, opening a Card Management: Message page. Narrator: To extract a cost centre report for cards that have cost centres applied, click on ‘Run Reports’. Find ‘Cost Centre Report’ in the list of options and click ‘View’. Cursor navigates to Cost Centre Report highlighted in blue then selects View, opening a Cost Centre Report page revealing a list of options and fields. Narrator: You can refine the report by selecting the cost centre and invoice date. You can also define how you would like the results to be arranged. Then click ‘Run Report’. Cursor navigates to Run Report button highlighted in blue and selects, opening a Card Group/Cost Centre Summary Report page. Narrator: The report displays Fuel Quantity for the invoiced period, in addition to the dollar value including and excluding GST. It also contains the financial information for any non-fuel purchases in the invoice. Cursor navigates to show different information fields per narration. Narrator: You can then choose to download or print the report for your records in the navigation bar at the top of the page. Compare fuel efficiency of vehicles on your account: Get detailed insights into your overall business vehicle efficiency. A narrated visual guide demonstrating how to compare fuel efficiency of vehicles on your account with Shell Card Online, as part of a series of Shell Card Online video tutorials exploring the key features of the service. The Fuel Management Report page. Narrator: Do you need a snapshot of all your account purchases, usage, last odometer readings and fuel efficiency of your vehicles to improve your overall business fleet efficiency? Narrator: Simply go to the ‘Reports’ menu on the home page and click on ‘Run Reports’. Cursor navigates to Reports option highlighted in blue in menu sidebar on left of screen and selects. Reports page opens on screen, showing available options. Cursor selects Run Reports, opening the Reports: Management Information Reports page. Narrator: Find ‘Fuel Management Report’ in the list of options and click ‘view’. Cursor navigates to Fuel Management Report option highlighted in blue, opening the Fuel Management Report Page. During narration, cursor navigates to show available options. Narrator: You can refine the report by selecting the cost centre and invoice date. You can also define how you would like the results to be arranged under the Primary sort field. Then click ‘Run Report’. Cursor navigates to and selects Run Report button, opening a Fuel Management report page. Narrator: The report shows you the transactions attributed to each vehicle over the selected period, and provides a rolling year comparison. The fuel efficiency is based on the kilometres per litre calculated on the odometer prompts. Cursor navigates to show pertinent information in the report highlighted in blue. Narrator: You can then download or print the report for your records by either selecting ‘Download’ or ‘Print’ at the top of the page. How to format your electronic files: See how to download easy to follow editable Excel files for your statements and invoices. 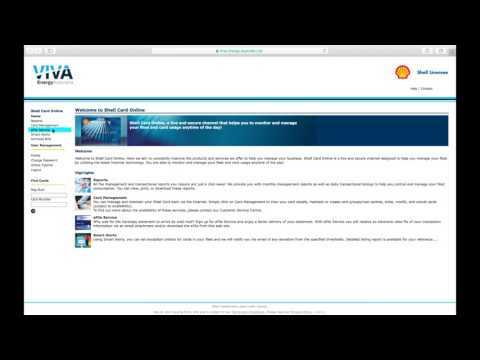 A narrated visual guide demonstrating how to format your electronic files with Shell Card Online, as part of a series of Shell Card Online video tutorials exploring the key features of the service. Narrator: How to format your electronic files. The Electronic File Download page of Shell Card Online website, showing list of files available for download. A file is selected for download, triggering a download animation and opening an Excel spreadsheet. Narrator: Shell Card Online provides you with formatting tools so you can receive easy to follow and editable Excel files including statements and invoices. The Welcome to Shell Card Online User account page. Narrator: Simply go to the eFile Service section on the home page and select ‘File Format Tools’. Cursor navigates to the eFile Service option in the sidebar menu at left of page highlighted in blue and selects, opening the eFile service options page. Cursor then navigates to Electronic File Format Tools option highlighted in blue and selects, opening the Electronic File Format Tools page. Narrator: This brings up the formatting tools available to download for each file type. Note that you will need Microsoft Excel 95, 97 or 2000 for the tools to work. Cursor navigates to text highlighted in blue detailing Excel requirements. Narrator: Find the file type you want to format and then simply ‘click here to download’. Cursor navigates to Click Here option highlighted in blue and selects, triggering a download file animation. Narrator: The download comes with instructions, but if you need help please call customer service on 13 16 18. Use smart alert emails for proactive monitoring: Stay on top of your expenses and ensure the economical running of your fleet with alert thresholds to control the use of your cards. 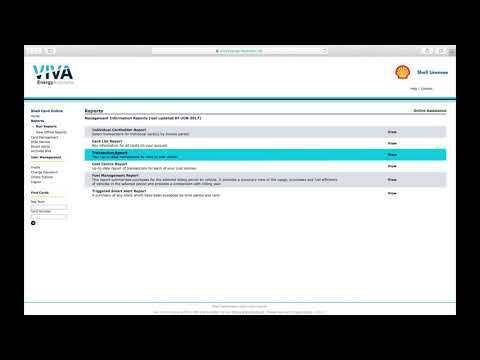 A narrated visual guide demonstrating ways to use Smart Alerts to help identify employees with increased transactions on fuel cards with Shell Card Online, as part of a series of Shell Card Online video tutorials exploring the key features of the service. Narrator: Ways to use Smart Alerts to help identify employees with increased transactions on fuel cards. The Card Management: Search for Cards to Maintain Alert Thresholds page of Shell Card Online website. Narrator: Smart email alerts help you monitor your vehicles and how employees use your fuel cards. Screen transitions to a Triggered Alerts report page showing transaction and volume related information. Screen transitions to a Triggered Alerts report page showing a daily transaction breach highlighted in blue. Narrator: - you can set a threshold for the total number of transactions made on your cards and a time frame, and be notified with an automatic email if the threshold is ever exceeded. Screen transitions to an email showing a Customer Alert Notification message from Shell Card Online, before transitioning to the Welcome to Shell Card Online User account home page. Narrator: First you’ll need to activate smart email alerts. To do that, watch the video titled how to use smart alert emails to proactively monitor your account. An animated call-out to ‘Watch Video: How to use Smart Alert to proactively monitor your account’ slides in from right of screen, and slides off again. Narrator: When you receive a smart alert email, you can generate a report that details all the transactions that triggered the alert in the ‘Smart Alerts’ menu on the home page. Cursor navigates to and selects the Smart Alerts option highlighted in blue in sidebar menu at left of Welcome to Shell Card Online User account page, opening the Smart Alerts page. Narrator: Click on ‘Smart Alerts Report’. Cursor navigates to the Smart Alerts Report option highlighted in blue and selects, opening the Triggered Smart Alert Report: Select Report Criteria page. Narrator: This brings up the ‘Triggered Smart Alert Report’ request page, which is also accessible through the ‘reports’ menu. Cursor navigates to sidebar menu at left of screen to indicate the Reports option. Narrator: You can refine the report by selecting a particular cost centre and alert type – in this case Transaction Counts Per Period. Cursor navigates to highlight the options available, selecting Transaction Counts Per Period from the Alert Type drop-down menu. It then clicks on the calendar icon in the Date Triggered section, opening the calendar and selecting a date. Narrator: You can also define the time period, either the date the smart alert was triggered or the date of the transaction. Screen returns to the Triggered Smart Alert Report: Select Report Criteria page. Narrator: Then click ‘Run Report’. Cursor navigates to Run Report button and selects, opening a Triggered Alerts report page. Using smart alerts to help identify fuel card misuse: See how to get alerted about purchases made outside designated limits, such as fuel volume and spend. A narrated visual guide demonstrating how to use Smart Alerts to help identify fuel card misuse with Shell Card Online, as part of a series of Shell Card Online video tutorials exploring the key features of the service. Narrator: How to use Smart Alerts to help identify fuel card misuse. The Triggered Smart Alert Report page. Cursor selects Run Report, opening a Triggered Alerts Report. Narrator: Smart email alerts can help you monitor how your employees use their fuel cards, and can send you a notification about any purchase made outside designated limits such as fuel volume, number of transactions or spend. Screen cuts to Triggered Alerts report showing different cost centre information revealing fuel volume data, then daily transactions information, then transaction spend data, before returning to the Welcome to Shell Card Online User account home page. Narrator: To help you identify fuel card misuse, you can extract a report showing the alerts that have been triggered based on the alert threshold you’ve set. Simply go to the ‘Reports’ menu on the home page. Narrator: If you want to receive email notifications automatically, you will need to activate smart email alerts. Watch the video titled ‘How to use smart alert emails to proactively monitor your account’. Cursor navigates to Run Reports option and selects, opening the Reports: Management Information Reports page. Narrator: Find ‘Triggered Smart Alert Report’ in the list of options and click ‘View’. Cursor navigates to Triggered Smart Alert Report option highlighted in blue and clicks View, opening the Triggered Smart Alert Report: Select Report Criteria page. Narrator: You can refine the report by selecting a particular cost centre, Card Number, Driver or Rego Number, and specific Alert type. For example, Incorrect or Missing odometer, or Total spend per period. Cursor navigates to highlight options available. Narrator: You can also define the time period or date the alert was triggered, or specify the transaction date. Cursor navigates and selects Date Triggered option, opening a pop-up calendar screen and selecting a date range before returning to Triggered Smart Alert Report page. Narrator: There are many ‘Alert types’ to choose from. Select one alert type and then click ‘Run Report’. Cursor navigates to and selects Run Report button, opening a Triggered Alerts report. Narrator: This report allows triggered alerts to be viewed and can be sorted on the various Smart Alert options. You can then download or print the report for your records by either selecting ‘Download’ or ‘Print’ at the top of the page. Identify employees not recording odometer readings: Learn how to generate a report that helps identify those not recording odometer readings o their fuel purchases. 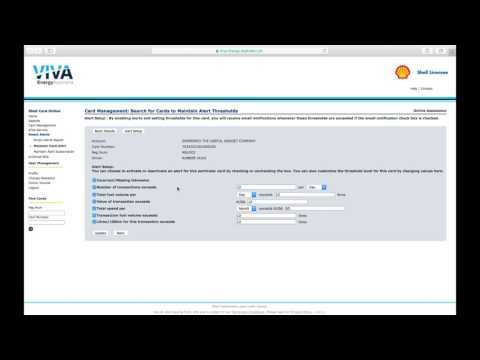 A narrated visual guide demonstrating how to identify employees who are not recording odometer readings on card purchases with Shell Card Online, as part of a series of Shell Card Online video tutorials exploring the key features of the service. Narrator: How to identify employees who are not recording odometer readings on card purchases. A Shell Card Online page displaying a Fuel Management Report, with Latest Odometer field highlighted in blue. During narration, cursor navigates to show relevant information. Narrator: Odometer readings can be useful in many ways, from monitoring the fuel efficiency of a vehicle to scheduling its maintenance. Screen transitions to a Triggered Alerts report page displaying Incorrect/Missing Odometer information. Narrator: But these benefits rely on your employees providing accurate odometer readings every time they refuel. Screen transitions to an email showing a Customer Alert Notification message from Shell Card Online. Through Shell Card Online you can set a smart alert to notify you with an automatic email if odometer readings are incorrect or missing. Screen transitions to the Welcome to Shell Card Online User account home page. Smart Alerts option in sidebar menu at left of Welcome to Shell Card Online User account page is highlighted in blue. Cursor navigates to and selects Smart Alerts from the sidebar menu, opening the Smart Alerts page and selecting the Smart Alerts Report option highlighted in blue. A Triggered Smart Alert Report: Select Report Criteria page opens. Narrator: You can refine the report by selecting a particular cost centre and alert type – in this case Incorrect or Missing Odometer. Cursor navigates to show the criteria that can be selected, before clicking on Incorrect/Missing Odometer in the pull-down Alert Type menu. Cursor navigates to calendar icon and selects, opening a pop up calendar and selecting a date, returning to the Triggered Smart Alert Report page. Using smart alerts to help identify increased transactions: Learn how set thresholds and time frames to identify card use for personal vehicles. Better monitor fuel card spending above specified limits: Set thresholds for fuel purchasing and get alerted when those limits are exceeded. A narrated visual guide demonstrating how to better monitor fuel card spending above specified limits with Shell Card Online, as part of a series of Shell Card Online video tutorials exploring the key features of the service. Narrator: How to better monitor fuel card spending above specified limits. The Card Management: Search for Cards to Maintain Alert Thresholds and Alert Setup page of Shell Card Online website. The Total fuel volume per variables are highlighted in blue. Narrator: - and a time frame, and be notified with an automatic email if the threshold is ever exceeded. Screen transitions to an email showing a Customer Alert Notification message from Shell Card Online, before transitioning to the Welcome to Shell Card Online User account home page. Screen transitions to a Triggered Alerts report page. Narrator: First you’ll need to activate smart email alerts. Narrator: To do that, watch the video titled how to use smart alert emails to proactively monitor your account. Narrator: You can refine the report by selecting a particular cost centre and alert type – in this case Total Fuel Volume Per Period. Cursor navigates to highlight the options available, selecting Total Fuel Volume per Period from the Alert Type drop-down menu. It then clicks on the calendar icon in the Date Triggered section, opening the calendar and selecting a date. Better monitor transactions made on your fuel cards: Learn how to access Smart Alert reports and refine the usage insights they provide. A narrated visual guide demonstrating how to better monitor transactions being made on your fuel cards through Smart Alert reports with Shell Card Online, as part of a series of Shell Card Online video tutorials exploring the key features of the service. Narrator: How to better monitor transactions being made on your fuel cards through Smart Alert reports. Screen transitions to a Triggered Alerts report page showing Transaction value information highlighted briefly in blue. Narrator: - and be notified with an automatic email if the threshold is ever exceeded. Narrator: You can refine the report by selecting a particular cost centre and alert type – in this case Maximum Transaction Value. Cursor navigates to highlight the options available, selecting Maximum Transaction Value from the Alert Type drop-down menu. It then clicks on the calendar icon in the Date Triggered section, opening the calendar and selecting a date. Use smart alerts to better monitor fuel usage targets: Learn how to set up your smart email alerts to establish your Maximum Transaction Volume. A narrated visual guide demonstrating how to use Smart Alerts to better monitor fuel usage targets with Shell Card Online, as part of a series of Shell Card Online video tutorials exploring the key features of the service. Narrator: How to use Smart Alerts to better monitor fuel usage targets. Screen transitions to a Triggered Alerts report page showing Transaction fuel volume information highlighted briefly in blue. Managing spend vs budget with smart alert reports: See how use Smart Alert reports to prevent unwanted surprises at invoice time. Access and download your invoices: See how to access and download all your invoices and transaction listings to prepare for tax time. 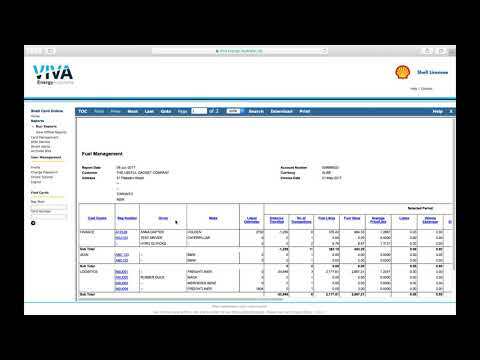 A narrated visual guide demonstrating how to access and download your invoices with Shell Card Online, as part of a series of Shell Card Online video tutorials exploring the key features of the service. Narrator: How to access and download your invoices. Narrator: With Shell Card Online all your files, including invoices and transaction listings, are kept securely in one place, ready for you to download. Simply go to the eFile Service section on the home page and select ‘File Download’. Cursor navigates to the eFile Service option in the sidebar menu at left of page highlighted in blue and selects, opening the eFile service options page. Cursor then navigates to Electronic File Download option highlighted in blue and selects, opening the Electronic File Download page showing a list of files available for download. Narrator: This takes you to your ‘Electronic File Download’ page. Choose the appropriate account from the drop down menu under your Account Details. Cursor demonstrates how to select Account from the drop down menu. Narrator: You’ll see a convenient list of all your available files. You can also see a file description, the file type, its size, and the date it was created, which is how the list is sorted. File Description field, File Type, Size, and Date created fields are highlighted blue in sequence. Narrator: Large files may be zipped to compress them, indicated by a ‘Y’ for yes or ‘N’ for no. Zipped field is highlighted in blue. Narrator: ‘Action’ tells you the file is ready. Simply find the file you want and click on ‘download’. Cursor navigates to file Download option highlighted in blue and selects, triggering a download animation. Narrator: If you have problems at any stage, please call customer service on 13 16 18 and we’ll be happy to help. Changing the way you receive invoices: Learn how to update your notification and electronic file delivery preferences. A narrated visual guide demonstrating how to change the way you receive invoices and transaction listings with Shell Card Online, as part of a series of Shell Card Online video tutorials exploring the key features of the service. Narrator: How to change the way you receive invoices and transaction listings. Narrator: With Shell Card Online you can choose to receive notification and delivery of your electronic files in the way that best suits your needs. Simply go to the eFile Service section on the home page and select ‘File Delivery Options’. Cursor navigates to the eFile Service option in the sidebar menu at left of page highlighted in blue and selects, opening the eFile service options page. Cursor then navigates to Electronic File Delivery option highlighted in blue and selects, opening the Electronic File Delivery Options page. Narrator: This brings up the ‘Electronic File Delivery Options’ page. Your Account Details appear at the top. Account Details information is highlighted in blue. Narrator: Choose the appropriate account from the drop down menu. Cursor navigates to and selects account from drop down menu. Narrator: Then select the option you prefer for both your Invoiced Transaction Listing and your Shell Card Invoice electronic files. Cursor navigates to Option 1: Don’t email me at all, highlighted in blue in the File Delivery Options section. Narrator: If you choose option one, you will not be notified when your files are ready to download. Cursor navigates to Option 2: Notify me via email when file is ready for download, highlighted in blue in the File Delivery Options section. Narrator: Choose option two and you’ll receive an email notification that your file is ready. Cursor navigates to Option 3: Send me the file as a secure attachment via email, highlighted in blue in the File Delivery Options section. Narrator: Choose option three and the file will be emailed to you as a secure attachment. If you choose option three you will need to create an email delivery password between six and twelve characters. Cursor navigates to email Delivery Password field and enters password details. Cursor navigates to Submit button and selects, opening a Message screen saying Update Successful. Narrator: If you have problems at any stage, please call customer service on 13 16 18 and we’ll happy to help. Downloading tax statements: Learn how to remove the need for individual receipts, and prepare for your BAS by extracting your transaction statements.